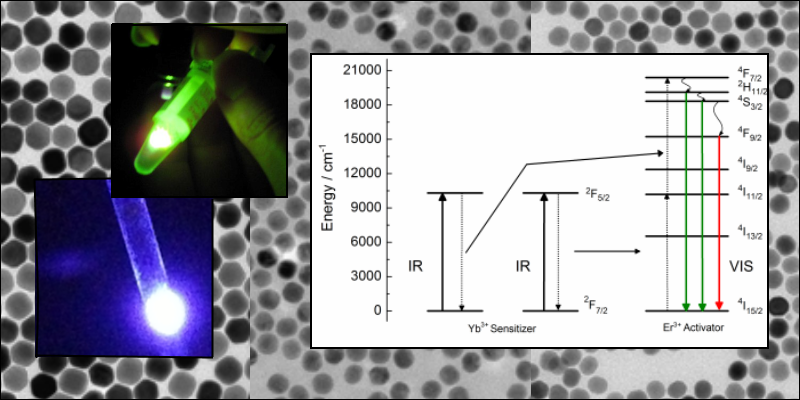 Up-conversion materials are materials that can convert low-energy radiation (for example near-infrared, NIR) into higher energy radiation – usually light. This can be done with using rare earth ion pairs such as Yb3+-Er3+, Yb3+-Ho3+ or Yb3+-Tm3+ in different host materials. The advantage of using this type of luminescence labels in biomedical assays is the elimination of autofluorescence during the measurement process and the possibility to use whole blood as a sample matrix. As for the solar cells, the up-conversion particles could be used in utilizing the IR radiation from the Sun that the conventional solar cells are yet unable to harvest for energy use.